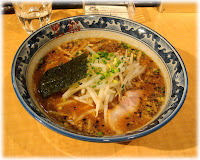 The specialty at Kookai (kookai = "air and sea") branches is a thinner-textured, saltier tonkotsu gyoukai broth, with few to no powdery particles swimming at the bottom. 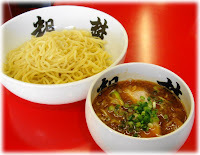 If you like the taste of tonkotsu gyoukai but are put off by the thickness or the texture, then you might want to consider a branch of the Kookai chain. They also have a shoyu-based version that I have not yet tried. This branch on the Ebisu/Shirokane border (near the good Chinese place Totenkai) is a bit cramped but has a wing sticking out in front with some larger tables. 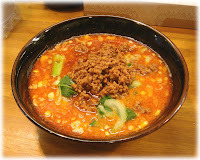 Noodle portions at Kookai branches tend to run small, and the noodles will typically be linguine-style, similar in width and firmness. Also ask for no nori on top (nori nuki de onegai shimasu) if you don't want any of that stuff. Depending on the branch your noodles and toppings may be served in either a wooden basket or a wooden tray. Excellent aburi chanshu and boiled greens top off the dish nicely, however the aburi chashu (炙り　焼豚) may add 2-300 yen to the price. Kookai branches are generally also clean and well-run, good places to go.